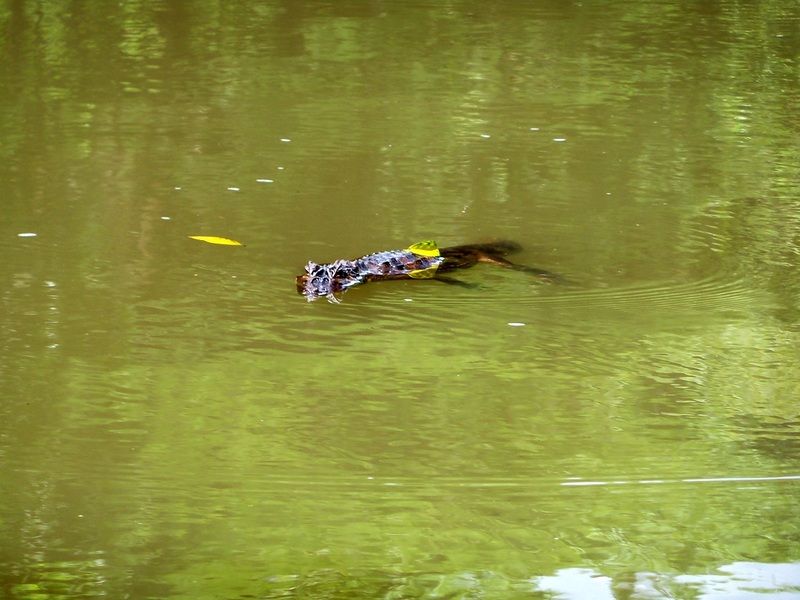 Danger in the River Chiriqui – Caiman Spotted! Kris and I love taking our cameras down to the river behind our house, we never know what we’ll see. I was busy taking some close-ups when Kris called to me to come quickly, NOW!. I got up to see what she was talking about and was quite surprised to see a small caiman floating about 20′ from shore. I say small because in Sarasota, Florida, where we lived before coming to Panama, I had seen many alligators from 8′ – 10′ long. I did some research and found that the Panama caiman can grow up to 8′ long, that’s a lot bigger than I thought they grew! i don’t feel particularly threatened by the presence of this little guy but it may have a big brother, SO…..I now will be a little more vigilant if I decide to take a dip in our beautiful and possibly dangerous river. Posted on May 12, 2013 by joeltc1. This entry was posted in Panama. Bookmark the permalink. You got some good photos of it, and I love the video! I wouldn’t have seen it but for you showing it to me, thanks! Are these caimans dangerous? I thought they only fed on fish, and I wonder if the recent drought you were talking about has forced them upriver. If so, they could be more aggressive than what I read about. What are the locals saying about their appearance? were responsible. I don’t know what the locals say, I’ll have to ask. As much as I can recall I havent read much about Cayman attack to humans in Panama. Even with that information I will keep myself at a distance from this animal. People should call the Anam to hunt him and relocate to another place not dangerous for humans and pets. how fun! yes, just be sure there are no cocodrilos in the area! those are the ones you need to watch! ask teh locals, ‘where are the cocodrilos?’ you might get some interesting answers!